There are few tales more heroic tale that the one of George Jørgensen, who in 1952 took one small step in stilettos and one giant leap for humankind when he entered Copenhagen’s Rigshospital a man and left a blonde bombshell destined for fame, fortune and Hollywood heartbreak. As a boy growing up in the Bronx in pre-war New York, George Jørgensen (born 1926) always felt a little different. The son of Danish-born parents, young George made painstaking efforts to fit in, despite his naturally lithe, girlish physique. Just after World War II, Jørgensen was drafted into the US Army and served 14 months, an experience which only served to confirm his growing suspicions that Mother Nature had made some kind of mix-up. Already an experienced military communications expert, Jørgensen was a keen researcher who pored tirelessly over journal articles in a mission to discover what might be wrong; he soon learned that groundbreaking sexual reassignment surgeries were already being performed in Scandinavia. Fluent in Danish thanks to the heritage of his parents, George made haste to Copenhagen in 1950. Long Island historian Donald J Myers wrote in a later account of Jørgensen’s transformation, ‘A Changed Man’, that Jørgensen found Danish doctors sympathetic to his appeal – even peppering the idea with an inimitably Danish sense of humour. It took two years of hormonal treatment followed by three operations to help him make his successful leap into womanhood. However, the story was leaked by a Jørgensen family friend to a New York tabloid after the second round of surgery, and broadsheet hacks leapt on the sensational value of the Jørgensen story to feed the public’s insatiable hunger for salacious tidbits. According to historian Leisa D Meyer, there was no shortage of nicknames slapped on the now Christine Jørgensen – from ‘The Convertible Woman’ and ‘The Misfit in Mink’ to ‘The Tops in Swaps’ and ‘The Turnabout Gal’. American GIs at a Korean armistice camp crowned her ‘Miss Neutral Zone 1953’. But if it can be said that any woman emerged from the foam like a modern-day Venus, it was Jørgensen – gangly and self-conscious as a boy, she was a knockout as a woman. Infamous American writer Truman Capote was taken with her, and Hollywood hob-nobbers Tony Curtis and Roger Moore were well-known callers. Jørgensen was promptly named ‘Woman of the Year’ by several organisations in the US, Scandinavia and Belgium – and as for Jørgensen’s parents, they welcomed their ‘newborn’ daughter with open arms. Unable to escape her celebrity, Jørgensen opted instead to flaunt it, and she made a comfortable living for the next two decades on the US talk-show and lecture circuit, moonlighting as an actress and cabaret performer known for her tongue-in-cheek renditions of ditties like Oscar Hammerstein’s ‘I Enjoy Being a Girl’ and ‘Bewitched, Bothered, and Bewildered’. 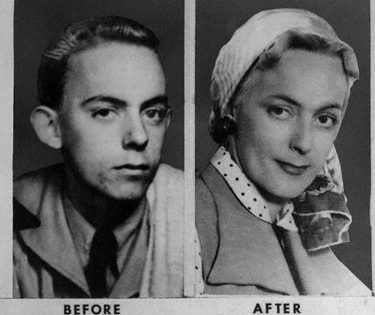 There was, however, a hitch to Jørgensens’s new-found life as a woman. Though a great beauty, a great personality and a fetching actress, Jørgensen could never be a bride. In 1959, Jørgensen made headlines after falling in love with 33-year-old Howard J Knox, who lovingly declared: “She’s got the greatest body of any woman I’ve ever seen – and I’ve seen a lot!” The marriage was never recognised, as Jørgensen’s birth certificate still identified her as a male. Though engaged twice in her life, Jørgensen was never married. In 1967, Jørgensen took time to reflect on the twists and turns of her adult life and produced an autobiography, ‘Christine Jørgensen: A Personal Biography’. The book not only included the camp sense of humour that the American press and public had come to secretly adore, but also the difficulties of growing up, as she felt, in the wrong skin. Coming as it did on the cusp of the sexual revolution and the Stonewall Riots, which launched the American gay rights movement, Jørgensen’s autobiography articulated the plight of many youngsters struggling with their sexual identities. As she aged, Jørgensen continued to relish her role as a sexual pioneer for transgendered young people. Her success on the lecture and lounge circuit was enough for her to retire to a sprawling estate south of Los Angeles. In her 50s, she had a facelift operation, adding glibly that she wasn’t too proud to fool with nature. Friends remembered her as a vibrant wit forever nursing a cigarette and a scotch as she reflected on a remarkable life. “I’m proud, looking back, that I was on that street corner when the [sexual revolution] movement started . . . We may not have started it, but we gave it a good, swift kick in the pants,” she observed. Jørgensen died of bladder and lung cancer in California in 1989, aged 62.